The Church begins the third week of Lent by celebrating the first of three rites called Scrutinies for the Elect (those who are preparing for Baptism at Easter). It is a time for the Elect to search deep within themselves to uncover all that is weak and broken and sinful in their hearts. Like the women at the well in today’s Gospel, they thirst for the life giving waters of baptism. They are hungry for the Eucharist, the true bread from heaven. In the first reading from Exodus, we find the people grumbling and complaining to Moses. They are desperate to quench their thirst. Although God has done great deeds for them and satisfied their hunger with bread from heaven, they still have trouble trusting Him. The desert is a desolate and parched land, and the journey is long and difficult. So they stumble and fall. They have trouble trusting, and so God instructs Moses to bring forth water from a rock. The water flowed from the rock yet the people still questioned God’s presence. In the Responsorial Psalm God urges us to “harden not our hearts”. We are called to trust God and to believe that he has a plan for our good. God will do great things for us if we trust in Him. St. Paul tells us that we can trust in God because of Jesus. We can stop grumbling like the Israelites in the desert, because we can have certain faith and certain hope through the sacrifice of Jesus Christ. In Him we can achieve peace and stop rebelling. We can trust because we worship what is the true, the beautiful, and the good. Trust and worship of God is how we come to have a relationship with Him. It is impossible to adequately discern the depths of today’s Gospel. St. John really goes to town on symbolism; there is much hidden meaning to uncover. Jesus reveals himself to a Samaritan women, a non Jew. He is tired and thirsty and asks for a drink. But the tables are turned when he tells her that he is the living water. 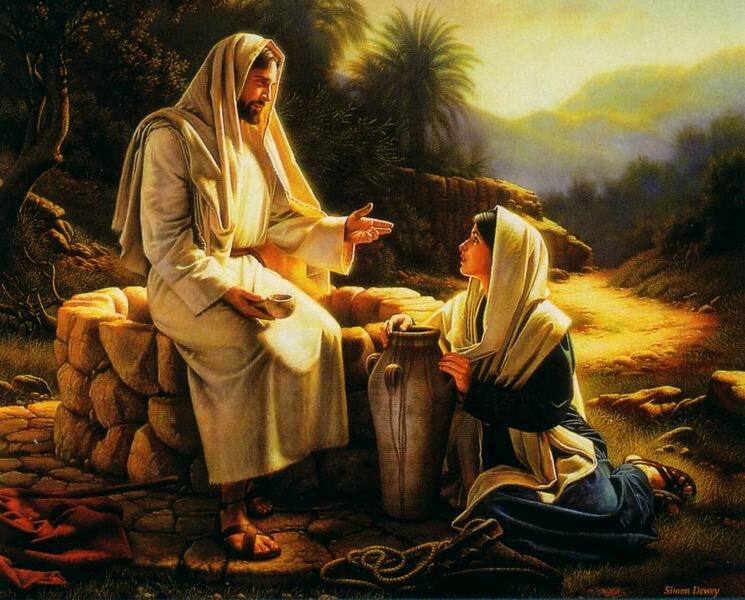 She asks, “Sir give me this water.” The women knows that only Jesus can quench her thirst. The woman does not flinch when Jesus reveals her sin. She accepts his judgment and forgiveness. She repents and goes to spread the Gospel to her people. They believed because of her testimony. Let us pray that we can repent and seek out the Sacrament of Penance and Reconciliation so that we can be set free to see Jesus and accept his great mercy. It is only then that our thirst can be quenched. This entry was posted in Liturgical Year and tagged 3rd Sunday Lent year A, Catholic, Woman at the well. Bookmark the permalink.